NOSTALGIA… BECAUSE “BACK” IS WHERE IT’S AT! People love remembering the good old days and the way things were. 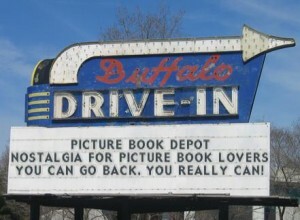 At Picture Book Depot,we bring you the best old pictures and picture books to put you in that “yesterday” mood. You hung your wet clothes OUTSIDE on the clothes line? You played “Kick the Can” until you couldn’t kick anymore? You had to be home before the street lights came on? Penny candy actually cost a penny? You could buy loose cookies for a couple of pennies? You could buy a single “hot frank” instead of a whole package? Your brother cut the grass with a manual mower? You played “Around the World” at the basketball rim in your neighbor’s backyard? Being rebellious was sneaking and eating yet another candy bar when your Mom told you not to? WE REMEMBER! And we’re using this page to help you remember, too. So just sit back, relax, and go back, back, back to those beautiful days. Here we go again. Will the Grinch finally manage to steal Christmas??? A young boy learns you have to make a move to make a change. A young girl whose mother is gravely ill must try to earn enough money to make it to the Ragamuffin's Parade. When a goat is barred from a baseball game, he puts a curse on the Chicago Cubs. Never let anyone tell you that what you've created isn't good enough! A statue of a prince who once lives tries to right some wrongs in life. A young girl's love of nature changes the course of education! A sweet little barn relocates to a new home. A young farm girl must find the bell that inspires one of the family's dairy cows.